Allam (…) displays a great comic actor’s mastery of his role, gives the setpiece speeches with wit and authority, but also delivers some of Falstaff’s most brilliant asides with perfect timing. 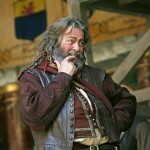 But he’s buoyed on a bubble of wit and clever bartering throughout, and insists on keeping the audience in on the joke. It’s the kind of performance that prospers in the Globe, hogging 20 per cent of all lines across the two plays, and Allam has probably never generated as much affection in all the years of his career at the RSC and elsewhere. 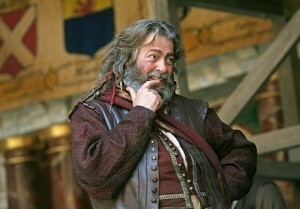 Allam is so watchable and articulate (and, yes, funny) that you almost forget that Falstaff is a corrupted bag of toxins. Allam’s ripe, roguish charisma is as delightful as it is dazzling. Both plays only sing when Parker and Allam are on stage. Perhaps Part 2 suffers from sequel syndrome, with comic set pieces showcasing Falstaff’s carry-on. But what a carry-on Allam makes of it. Although generously padded out to ensure his skin ‘hangs about him like an old lady’s loose gown’, it’s the sheer force of his charismatic personality that fills the stage.